Are you a sales representative who is not getting paid the commissions that you have rightfully earned? Is there a dispute as to the correct amount of sales commissions you are owed? Did your principal terminate your sales representative contract after you procured a large business deal in order to avoid paying you commissions? Fortunately there are laws in Michigan and other states which protect independent sales representatives from manufacturers or suppliers who refuse to pay commissions on business procured by the sales agent. Many states also have statutes which allow a sales representative to recover penalty damages and attorney fees when a principal fails to pay commissions in a timely manner. For instance, M.C.L. 600.2961, Michigan’s Sales Representatives Commission Act (“SRCA”), requires a principal to pay all commissions due at the time of termination within 45 days after termination, and to pay all commissions which become due after termination within 45 days after such commissions become due. A principal that is found to have intentionally failed to pay the commissions within these time limits is liable not only for the overdue commissions, but also for penalty damages equal to 2 times the amount of unpaid commissions, or $100,000, whichever is less. A prevailing party is also entitled to recover reasonable awarded attorney fees and court costs under the SRCA. 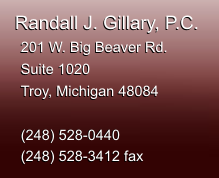 The sales representative attorneys at the Law Offices of Randall J. Gillary, P.C. have successfully handled hundreds of cases involving unpaid and overdue commissions including post-termination sales commissions. We have successfully tried many cases. We have also favorably resolved many cases through alternative dispute resolution (“ADR”) such as arbitration, facilitation, and mediation. In many instances ADR can reduce the time and expense of recovering unpaid commissions, as compared to going to trial. We are well prepared to handle your case through its conclusion, whether by trial or by ADR. The Law Offices of Randall J. Gillary, P.C. can help you create an effective sales representation agreement for use with your employer/principal and offer guidance in negotiating a current contract. Contact the Law Offices of Randall J. Gillary, P.C. if you are not being paid all of the sales commissions you have earned or if you need assistance with creating or negotiating a sales representative contract. Please contact us or call the Troy, Michigan office at (248) 528-0440 to set up an appointment.